Smiling residents of Golden Age Home in Lautoka after receiving their donation on July 21, 2018. 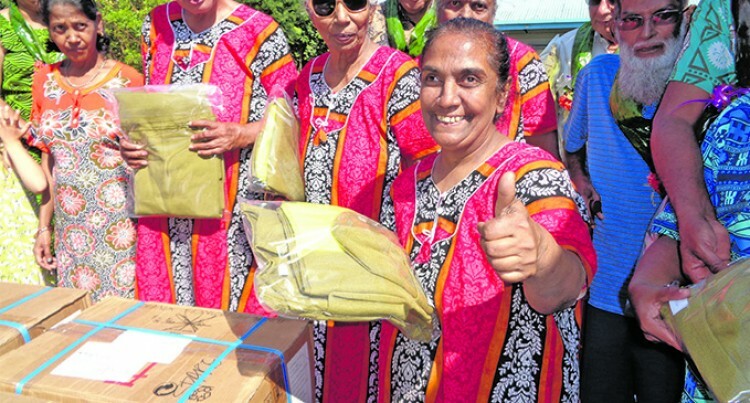 It was a blessing for residents of Golden Age Home in Lautoka after being assisted with new clothing and sleeping materials. Resident Shanti Singh, 52, was short of words to describe the moment. “We do not have anyone helping us and for them to visit us and give something it is really a blessing,” he said. Mr Singh said he believed in the concept of destiny and added that it was probably their destiny to be the recipients of this generous donation. The donation was done by Tranquil Textiles. Another resident, Rakesh Chand, said that he was overly excited as well. “I’m happy because we are the members of society,” Mr Chand said. He has been at the residence for the past five years and said moments like these made everyone happy and excited. Permanent Secretary for the Ministry of Women, Children and Poverty Alleviation Dr Josefa Koroivueta, who officiated the event, said senior citizens tended to face many challenges in their lives. Dr Koroivueta said that many people required the essentials and a roof over their heads. “Many are mentally challenged. They need a place to be sheltered and cared for,” he added. Dr Koroivueta said that he was really happy with the new budget allocation. “There is a new funding for the construction of a state home for elderly people,” he stated. Director for Tranquil Textiles Brad Wilson said that their team was really happy with the donation they made.